Eurovudas York Log Cabin: The Eurovudas York Log Cabin has 44mm double interlocking tongue & groove wall logs, which offer great protection against wind and water ingress. The cabin has 19mm floor boards included as standard, along with 19mm tongue and groove roof boards. The roof can also be protected by optional shed roofing felt material, and/or bitumen felt tile shingles in either green or black colour. All windows and doors are double glazed for additional heat retention and have the extra protection of a double rubber gasket. With its large double doors, two tall windows in the front, and double window in the side the York cabin allows in a lot of natural light and gives you great control over ventilation, whatever the weather. 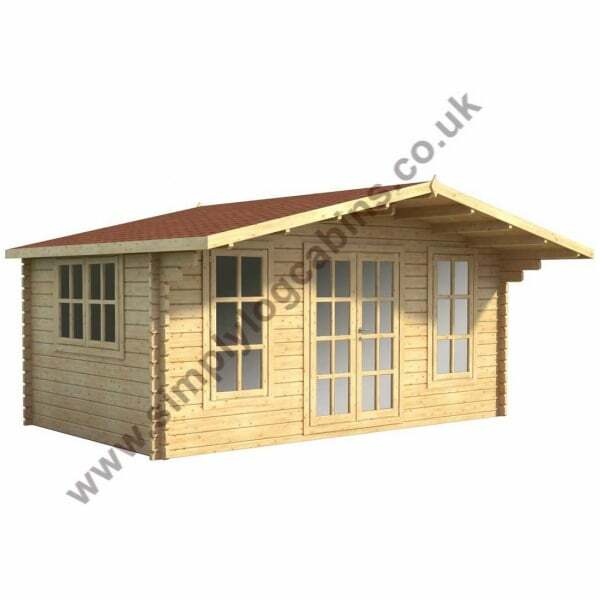 This cosy 5x3m log cabin is a highly attractive and functional garden building suitable for almost any space and a multitude of uses.